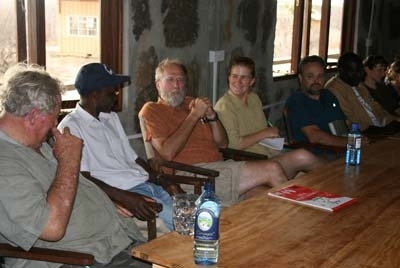 The Fifth Stony Brook Human Evolution workshop, entitled “Prehistory of the Turkana Basin: Opportunities and Priorities for Future Field Research”, took place on August 19-24, 2008 in Kenya. The workshop celebrated 40 years of research in the Turkana Basin and focused on the role the Turkana Basin Institute will play in facilitating future research in the region. 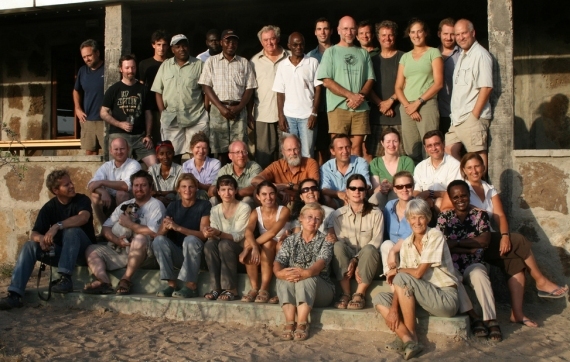 Thirty-two scientists from around the world made their way to the TBI research facility near Ileret in northern Kenya, three quarters of the way up the eastern side of Lake Turkana. Previously held on the campus of Stony Brook University in the U.S., this was the first Human Evolution Workshop to be hosted at the new facility at Ileret. A key item on the agenda was to introduce workshop participants to the infrastructure that will be available at the field stations on the east and west of Lake Turkana and how TBI might support and foster research within the Turkana Basin. Both the Ileret and the Nachechichok facility, currently under construction on the west side of the lake, would provide researchers with logistical assistance to conduct year-round excavations, trained personnel to assist with collection and preparation of fossils, and the opportunity to store, share, or rent equipment, to avoid hauling loaded trucks from Nairobi for three or more days over rough terrain. In addition comfortable accommodation, vehicle workshops and good communications are all available at the field stations. New relevant technological advances and their application to the future of research in the Turkana Basin and beyond were discussed as well. Technologies such as GIS and GPS have allowed a great deal of information to be collected and constructing extensive databases has become possible. Building from here, emphasis can be placed upon developing large scale maps of stratigraphical sequences, thereby giving finds a more reliable context. One of the most important topics focused on ways to increase direct involvement of African students, African institutions, and local communities in the research conducted in the basin. TBI is keen to engage Africans in its work at all levels, from employing and training fossil technicians and camp staff to providing positions and opportunities for postdoctoral candidates. Perhaps the most important aspect of this endeavour, as TBI board of trustees chair Richard Leakey mentioned on several occasions, is the positive impact that this project will have on the local communities and on East African students. Several community initiatives were discussed, including educational material, health access, school visits to sites, support for schools, improved local infrastructure, and, most important, the creation of sustainable employment opportunities. Numerous breakout sessions throughout the week involved topics such as tectonics and palaeoenvironments, later prehistory research, community outreach initiatives, potential for field schools, fundraising strategies, human evolution, and website community-building and data sharing. Tours of the Ileret facility highlighted TBI’s commitment to alternative energy and green technology. Solar cooking devices were recently installed, and water for the workshop was kept cool with evaporation coolers. The facility is powered by wind and solar energy, making the camp virtually carbon-neutral. A new, state-of-the-art laboratory was previewed by all, and internet connection provided by the camp’s satellite terminal enabled the workshop participants to keep in touch with the outside world. Visits to local communities and to the lakeshore were arranged as well and enjoyed by many of the participants. Fifth Human Evolution Workshop participants.